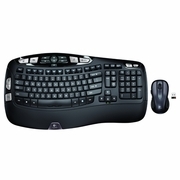 A mouse-and-keyboard combo that gives you a comfort curve without the learning curve. 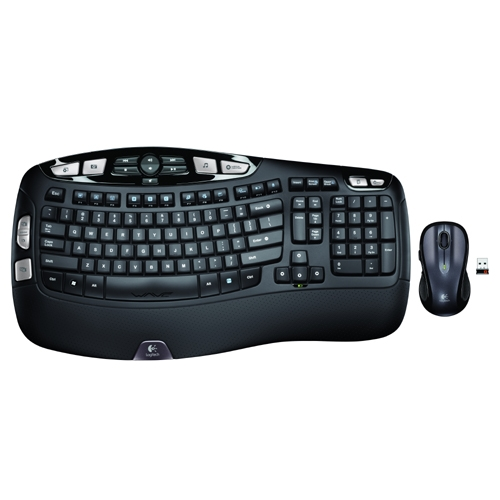 With a Comfort Wave Design keyboard, a contoured laser mouse, and batteries that last, this wireless combo gives you a comfort curve without the learning curve at home or at the office. Your hands get cradled in comfort by the Comfort Wave Design Wave + Curve + Palm Rest. The laser mouse keeps your hand happy and supported with contoured sides and soft rubber grips. Not ones to rest on our laurels, we looked at all of our options. We tried linear designs. Curved designs. Palm rests and no palm rests. And all the possible combinations. When we put them to the test, the clear favorite was the keyboard with curve + wave + palm rest. The Wave keyboard was born. Unlike other curved keyboards, we used consistently sized keys. The subtle 5-degree curve was designed to let your hands open up and take a natural position instead of forcing your wrists to bend. And because each key is the same size and same distance from one another, you wouldn't need to relearn how to type. The cushioned, contoured palm rest mirrored the wave-shaped key frame. We added gentle indents to position your hands comfortably on the keyboard and used padded, soft upholstery so you'd have a cushy place to rest your palms when you're not typing. To bring all this comfort to the achy masses, we had to completely redesign nearly every element of the assembly process and our packaging. But the results were worth it. Independent studies show that the Wave keyboards significantly reduce the four major points of discomfort without causing a noticeable change in typing speed or accuracy. * It's comfort made easy. The palm rest helps position your hands comfortably on the keyboard and offers a comfortable place to rest your palms when you're not typing.